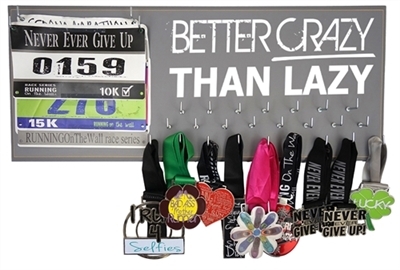 Our bib and medal hangers our specially designed for half marathon and full marathon runners. Our wooden board are made of MDF recycle wood. Yes we have chosen the eco-friendly path and pride ourself that all our wooden board have a low impact on our environment. All our race medal displays come in 20 different colors, with white lettering. You can also choose the size of your item. For example, you can select the vertical or horizontal format one giving the accent more on the race day number the other giving more an accent on the medals. They make a perfect gift for someone that recently ran a local race or even a virtual run. Although all our hangers for runners are made to order, we pride ourselves with a fast turn around and ship 1 to 3 business days via priority mail. You can rest assured to receive your item within a week. Shop now!